World University Orienteering Championship (WUOC) Team Announced! Orienteering Canada is pleased to announce that the following athletes have been selected to represent Canada at the 2014 World University Orienteering Championships, or WUOC. This championship will be held in Olomouc, Czech Republic from August 12-17, 2014 (website: wuoc2014.cz). There are three individual races at WUOC: a sprint, a middle, and a long distance race. All team members have been selected to run in all three individual races. There will also be two team relay races. WUOC is introducing a mixed-gender sprint relay, with two men and two women on each team. Graeme Rennie, Damian Konotopetz, Tori Owen, and Emily Kemp have been selected for this relay. The second relay is a 3 person relay. Robbie Anderson and Eric Kemp have been pre-selected to run in the Men’s relay team. Either Graeme or Damian will join the team depending on who is faster in the Middle distance race at WUOC. WUOC is a bi-annual event (taking place in even-numbered years). It is one of the more than thirty-two World University Championships, which are organized under the sanctioning of FISU (International University Sports Federation). WUOC is considered an important development opportunity for Canadian Elite orienteers. Olomouc is an exciting orienteering destination, and was site of the 2008 World Orienteering Champs. To see sample maps of the WUOC race terrain visit http://wuoc2014.cz/maps.html. Selection was made by the Senior Team Selection Committee, comprising this year of Brian May, Mike Waddington, and Magali Robert. Orienteering Canada and the High Performance Committee members would like to Brian, Mike, and Magali for their time and dedication to supporting Team Canada and the High Performance Program athletes! Rising Star Award ~ applications now being accepted! The High Performance Committee (HPC) are now accepting applications for the 2014 Rising Star Award. This annual award is given to two young, promising orienteers (typically one male and one female), and is valued at $1500 per athlete. Award recipients are chosen based on financial need, past results, future potential, and positive contribution to the Canadian orienteering community. The award can be won an unlimited number of times, but never more than twice consecutively. Last year’s recipients were Emily Kemp and Serghei Logvin. Eric Kemp and Louise Oram received the award in 2012. The process has changed this year. If you are an HPP athlete, you can self-nominate yourself for the award (as in previous years). If you are a member of an Orienteering Canada affiliated orienteering club, you can nominate an HPP athlete who you think is deserving of the reward. Nominations must be submitted between February 15, 2014 and March 2, 2014 (by 11:59pm PST) to hpp@orienteering.ca. If someone else nominates an HPP athlete, the athlete will be notified by March 5, 2014 and must submit a Rising Stars Award Application Form by March 15, 2014 in order to be considered for the award. For further information about the award, including the application forms, please refer to this link on Orienteering Canada's High Performance Program page. The nomination form should be submitted to hpp@orienteering.ca. Please consider applying for the award or nominating a deserving athlete! 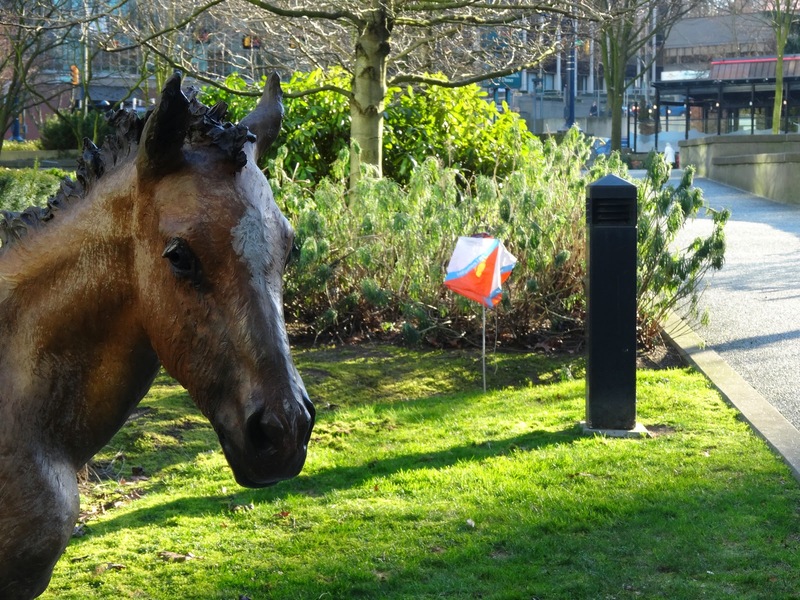 Its been nine years since the first Vancouver Sprint Camp, a cavalcade of sprint races and training sessions over a weekend organized by the Greater Vancouver Orienteering Club. In its ninth iteration, its grown from being an excuse to have an intensive weekend of training, to a rather huge endeavour, featuring two training sessions and 6 SI timed races, which includes a relay, farsta, and a setup and chase finale. This year's camp, for the first time, eclipsed 100 attendees. Before anything else, go check out their sprint camp page so that you can begin checking flights for next year. 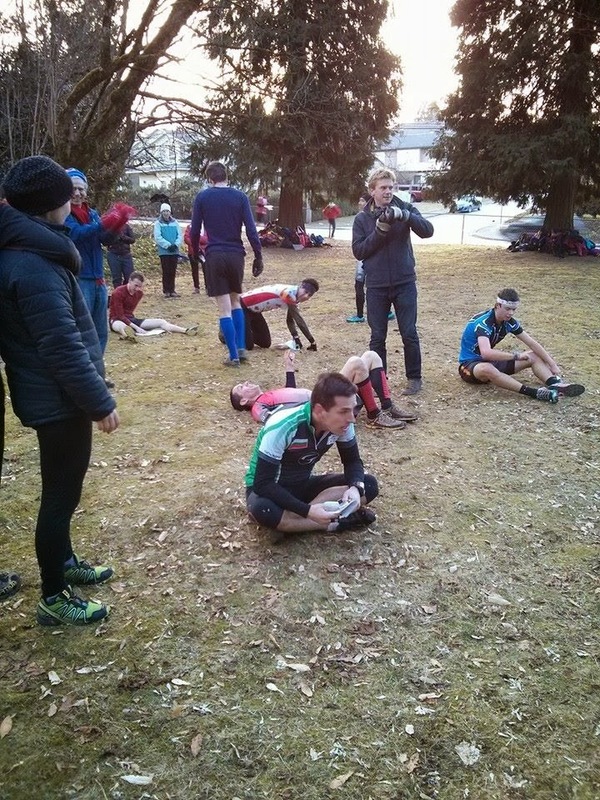 There are few other annual events in North America that has consistently drawn as large and as international a crowd over the past 10 years as has the Vancouver Sprint Camp, and the club & organizing team deserve props for making it happen! One of the biggest concerns going into this year's sprint camp was the weather. I can think of one other ubiquitous "sprint camp" that pretty much always features +3 degree temperatures and copious amounts of rain. Although Vancouver's climate is not dissimilar to that, we were instead treated to blue skies and slightly cooler temperatures. Honestly, though, would you rather be in 3 degrees and raining, or -4 and sunshine? Put on a hat, for goodness sake. Its currently -24 in Edmonton. This felt like a tropical island to me. 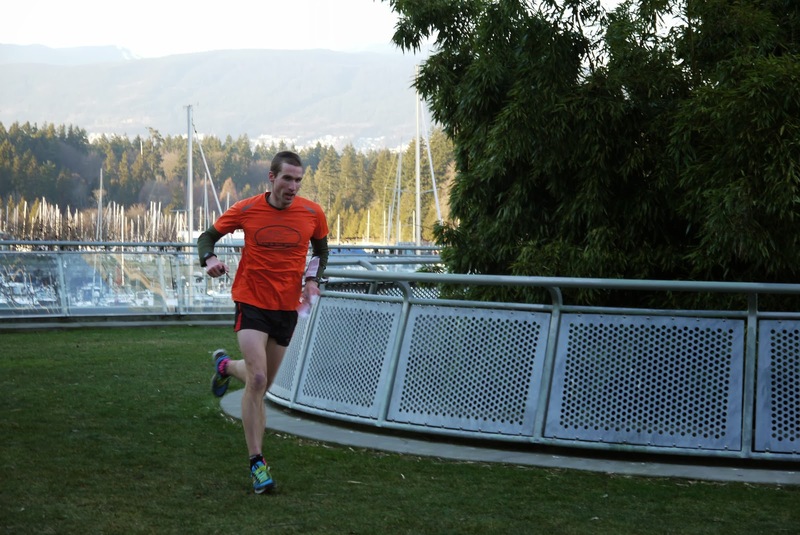 In fact, Friday's race, in downtown Vancouver, I wore shorts. I'm not quite sure how new maps seem to constantly materialize in Vancouver, unless new parks are magically appearing from thin air. It seems like every year, there is a collection of brand new sprint maps to race on. Saturday was an exhibit that, with several brand new sprint maps. These included Mundy Park, a zig zagging course also featuring far, far too many out of control off-leash dogs, and a sprint relay in the tiny Blue Mountain Park, which generally convinced everyone that, hey, sprint relays are fun and aren't going to ruin orienteering! Thank goodness for that. It was touch and go for a bit there. There was an interval session at the strange and varied residences of Lougheed North, a place that could easily be mistaken as European for its narrow passageways, staircases, and buildings that look remarkably identical, but which suddenly switches to apartment areas with canopies, dead ends, and uncrossable walls. From what I hear, though, the asphalt around that area is kind of hard. I don't recommend falling on it. The day wrapped up with what is usually considered the pinnacle of fun, the farsta event, a one-person mass start relay with all manner of chaos. Another mass start race that's popular with everyone? No forest solitude here, and still fun? This goes against everything the internet says! Hume Park was a small one, but with a deep set of ravines perfect for crashing down and hammering back up. You really need to resist the temptation of paying attention to anything else other than yourself, your map, and where you need to go. Simply finishing without mis-punching is an accomplishment in itself. If you haven't done a farsta yet, ask yourself why, and then go organize one. You won't regret it. The Farsta also provided ample Euroflop training. Sunday's classic setup and chase morning proved to be, as per usual, a good one as well. The setup at Byrne Creek was a varied course that suddenly switched from forest legs to urban legs and back to forest legs, and chase at Deer Lake North was your classic urban sprint, where you should finally hope you've learned which symbols are crossable and which are not, and that it is always, always crucial to check your control description. Is it inside corner or outside corner? Although it doesn't quite get the same world-O press, the original sprint camp in Vancouver features 10 sessions over one three days, which is almost twice as many training opportunities than that other one. There's also significantly less rain, a much, much greater variety of terrain, more varied race types, and did I mention, way less rain? Although its true there are no world champions giving any evening talks at the Vancouver Sprint Camp, we did have a chance to meet and chat with Canada's top marathoner from the London 2012 games, Dylan Wykes. And did anyone in Europe learn the meaning of "Smart Trombone", "Egoism Lining", and "A Inhuman Blend" at their sprint camp? Think on those a while. Maybe you'll figure it out. Announcing the 2014 High Performance Program athletes! Please join me in congratulating our athletes. You can follow our athletes on the Blog, on Facebook, or on Twitter! I'll be the first to admit that the High Performance Committee's (HPC) communication over the past few months has been lacking. We've been busy re-writing the Athlete Handbook, selection criteria, recruiting new committee members, finalizing a contract with Toni, reflecting on 2013, and looking forward to 2014. This isn't really the best excuse, since it's also our job to make sure you all know what we're doing to support our athletes. So, without further ado, here's an update of achievements throughout 2013, and our plans for 2014! We engaged Toni Louhisola in a volunteer capacity as the senior Team Canada coach. Toni worked mainly with the WOC athletes; however he did also work with some HPP athletes on a one-on-one basis. Toni did a great job connecting with athletes and working to improve their potential at WOC, considering the length of time they had to work together. Toni Louhisola visited Canada for 5 weeks in May/June; beginning in New York for the Team Trials before heading to Ottawa, Calgary, Cranbrook, and Vancouver. Toni worked with HPP athletes and local club members. He held training sessions and presented his theory of “Orienteering Thinking”. We engaged Brent Langbakk as the National HPP Junior Coach for another year. Brent worked in an advisory role, successfully finding local coaches for each of the junior HPP athletes. Brent worked with the coaches to assist them in developing physical and technical training plans for the athletes. Brent stepped down from this role in the fall, and we have yet to find a replacement head coach. Both WOC and JWOC were a success this year, with some solid results from our athletes. Brian Graham was able to step in as JWOC coach, as Brent was unable to attend JWOC. From a logistics standpoint, Stefan Bergstrom and Meghan Rance did excellent work as team leaders for JWOC and WOC respectively. We attended to two appeals; both of which were dismissed by external arbitrators. We began a strategic planning process, for both short and long term planning. The HPC will be including athletes and other community members in this process over the coming months. The HPC conducted major reviews of several of its key policies and documents including the Athlete Handbook, Athlete Agreement, Selection Policies, and the Orienteering Canada Appeal Policy. These changes are reflected in the 2014 versions of all these documents. We will continue to support our athletes with the endless paperwork and logistics surrounding major European competitions, including World Cups, WOC, JWOC, and WUOC. We have an amazing team of volunteers who are assisting with this process ~ thanks to WOC Team Leader Meghan Rance, JWOC Team Leader Stefan Bergstrom, and Tori Owen, who's assisting with World Cup registrations. The Rising Star award will be presented again this year, but with a change to the application process. Now members of the orienteering community can nominate athletes who qualify for the award. Details can be found here. We will work with Canadian clubs to offer the Canada Cup Elite Series, as a means to encourage more high level, local competition for our athletes. We are in the process of finalizing a 2-year contract with Toni Louhisola to work with the senior athletes for WOC 2014 and 2015. We are working to engage a coach to work with the junior athletes. It's been a few years since Orienteering Canada released it's Long Term Athlete Development Guide. This year the HPC has started looking at supplementing the High Performance Program to with an LTAD Pathway to provide better support and competition opportunities aligned with the LTAD for athletes as they progress through its Learn to Compete, Train to Compete, and Train to Win stages. Stay tuned for details throughout the year. As ever, we're always looking for positive and enthusiastic volunteers. We're looking for people to help with the day to day admin work, as well as those with experience who can help develop or support elite athlete programming. Please send an email to hpp@orienteering.ca if you're interested. Likewise, if you have any questions, comments, ideas, or feedback surrounding high performance orienteering in Canada, please get in touch. We love to hear from you!